It was a tense, highly stress-filled afternoon. Izzy Ezagui and his seven buddies in the Haruv Kfir unit of the Israel Defense Forces, were in a tent by the Gaza border this past January, during Operation Cast Lead — the War in Gaza. Izzy Ezagui and his seven buddies in the Haruv Kfir unit of the Israel Defense Forces, were in a tent by the Gaza border this past January, during Operation Cast Lead — the War in Gaza. You can see Izzy above with friends, and in the hospital with his father, just after his surgery. They’d just gotten word that the other members of their unit already in Gaza had sustained grave injuries and their head officer had been killed. They were supposed to go in and provide reinforcements to the unit. It was ten minutes till they were to head out. Rockets slammed into their tent, seriously wounding Izzy and three others. When the smoke cleared, Izzy saw that part of his arm was missing and that he was bleeding profusely. Sustained by some unbelievable inner strength, he walked out of the tent to the nearest bomb shelter where the medics began treating him. He was taken by ambulance and then helicopter to Soroka Hospital in BeerSheva. He lost 40% of his blood, yet the entire time he was awake and lucid. He was rushed into surgery – but first asked to speak to his mother. He came through the first surgery and a second one two days later with courage and stoicism that defy all odds. Izzy was discharged with honor. And today? Today he wants to volunteer for a second tour in the army as a combat officer. “I feel that after my injury, I can do even more than before. I feel I will help boost the morale of others,” he said. 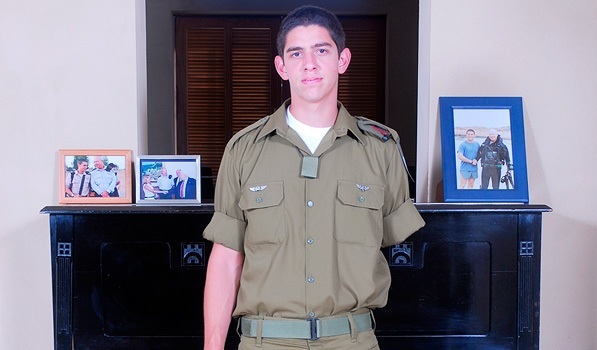 Izzy is an exceptional young man, even more so because he is not a native Israeli. He made aliyah to Israel from America at 19, entered the Israeli army, was gravely wounded, and now wants nothing more than to go back in and serve Israel again with all his heart. “I believe in the nation of Israel, in our history. I feel honored to be able to participate in protecting Israel,” he said. All of us can surely feel a tremendous pride in the courage, valor and commitment of this dedicated young man. Later when Izzy was in Tel Hashomer Medical Center, he and several other wounded soldiers were taken to see our Beit Halochem facilities. In fact, they went for several meetings. He was so impressed with what he saw there, with the specialized programs for wounded soldiers like him. As you know, our Beit Halochem facilities in Israel, are for soldiers like Izzy who have been severely wounded in defense of our homeland, and provide a home away from home. But they do so much more than that. At Beit Halochem, wounded soldiers, and civilian victims of terror, get ALL the help they need – and deserve — to return to productive, fulfilling lives. With a whole host of physical, swim, and occupational therapies, a wide array of sports activities that play a vital role in our veterans’ rehabilitations, and so much more, Beit Halochem provides everything that is needed to heal their broken bodies. Bodies have to heal, but so do minds. At Beit Halochem, soldiers get the emotional and psychological support they need to heal the very real wounds of post traumatic stress disorder. And this is still not all. Beit Halochem enables soldiers to be together with others who have gone through the same experiences. This provides a unique kind of companionship and understanding you cannot achieve anywhere else. Everything that our Beit Halochem facilities are able to accomplish is possible only through the generous and giving support of our dear friends like you who are part of Friends of Israel Disabled Veterans (FIDV) – Beit Halochem. With you by our sides, as our devoted partners, we have been able to turn around the lives of the many heroic young people like Izzy who have given so much for Israel and for the Jewish people worldwide. As we approach the High Holidays, a time of reflection, and a time to look ahead to the future, please keep Israel’s brave soldiers like Izzy in your heart. Please remember the enormous sacrifices they have made – and continue to make — on behalf of all of us, by making the largest gift you can to Friends of Israel Disabled Veterans – Beit Halochem so we can continue to care for them. I want to thank you for all you do and offer you our most sincere wishes for a Happy, Healthy and Peaceful New Year. To give you an even clearer picture of how important the Beit Halochem facilities are, listen to these numbers. From the start of the 2nd Lebanon War through the War in Gaza (and in the two years in between) 935 more soldiers were wounded and are being helped by Beit Halochem. This is in addition to the many thousands who were — and are — receiving support from Zahal Disabled Veterans Organization-Beit Halochem since its inception some 60 years ago. Your partnership with Friends of Israel Disabled Veterans – Beit Halochem is helping all of them. Thank you for your caring.